The art of the seventeenth and eighteenth centuries was generally tuned to a higher pitch than Renaissance art. The aesthetic was more florid and colourful, the lines more wavy, the decorative tendency more prevalent and the material effects more lavish. The contrast between light and dark also played a much more prominent role for artists. Here, the Italian artist Caravaggio (1571-1610) was a significant forerunner with his violent and realistic subject matter with religious themes. His paintings from around 1595 and onwards display particularly dramatic lighting against a dark background – an effective feature that heightens the theatrical, intense and transient nature of the subject. Contrasts, emotional appeal, drama, movement and a freer brushstroke are some of the common characteristics of the Baroque. To this, one might add illusionistic and decorative tendencies, as well as a richer palette and an overwhelming affinity for the extravagant. Today, the word “Baroque” is not only used for a cultural epoch, but also as a stylistic term that characterises the art and architecture that arose in Italy shortly before 1600 and spread particularly to the Netherlands, Germany, central Europe and Spain. Baroque art production was an expression of diverse developments that can be generally divided into three primary directions: The classically idealised, exemplified by an artist such as Nicolas Poussin, the realistic, exemplified by the work of Caravaggio or Rembrandt, and finally, a decorative virtuosity seen in e.g. the paintings of Rubens or the architecture of Borromini. At Nivaagaards Malerisamling, the Baroque period is richly and diversely represented with landscapes, portraits and genre paintings from both the Netherlands and Italy. In Rome, the Classical painters revered the ideal landscape. The basis for the genre can be traced back to the Renaissance, but the artist responsible for its configuration in the seventeenth century was the Bolognese artist Annibale Carracci (1560-1609). He worked in Rome for nearly thirty years, where he carried out a series of landscapes governed by a lyrical, Romantic atmosphere and poetically religious themes. This kind of landscape, which was further developed particularly in Rome by numerous painters in the 1600s, was based on the combination of sketched natural studies from the Roman Campagna and the use of a given composition scheme. The French-born painter Claude Lorrain, who came to Rome at a very young age, became the ultimate representative of precisely this type of landscape painting in the Baroque. Johannes Hage acquired an impressive example for his Collection. The social and societal changes had a vast impact on the development of art and artists in the various parts of Europe. In the Protestant Netherlands, where neither the court, the aristocracy nor the church continued to make commissions of any significance, the bourgeoisie gained a new, central position in society. Likewise, the middle classes began to play a decisive role as consumers of art. For the first time, portrait, landscape and genre painting gained an important position alongside the more traditionally revered categories in art with subject matter rooted in Classical history and mythology. Dutch painting in the seventeenth century is a richly nuanced chapter in art history. At Nivaagaards Malerisamling, there is a great number of prime examples of the extremely diverse art that was produced in the Netherlands during the Baroque. Rembrandt’s female portrait stands out for its part in the story of one of the greatest artists in all of art history. The work distinguishes itself particularly due to its subdued palette and delicate lighting against the dark background, upon which many Baroque portraits were executed. The artist’s thorough study of the portrayed subject’s distinctive qualities as well as the absence of any standard beauty ideals are some of the traits that characterise the work as typical of the period. 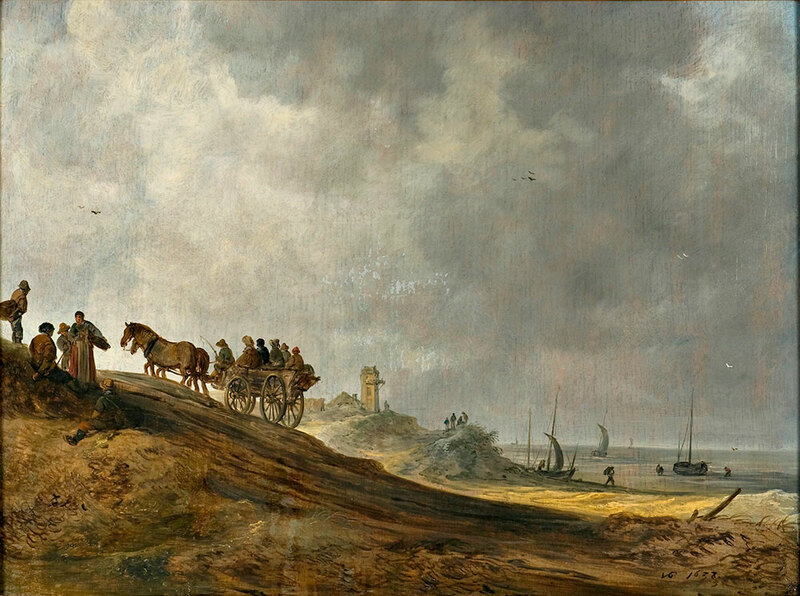 Other Baroque works in the collection include Meindert Hobbema and Salomon van Ruysdael’s landscapes. Both are excellent examples of how Dutch landscape painters sought out their subjects in their immediate, local environment. Despite their differences in expression, theme and brushstroke, the paintings are both representations of the world of stillness, where colours are muted and the palette often darkened, that lives in much of the seventeenth century’s Flemish art.